Social Networking has long since ceased to be the preserve of college students and teenagers. Now that the 50+market is truly engaged with Facebook and Pinterest, entire subset of the media and marketing business has effectively sprouted from Mark Zuckerberg’s Harvard dorm room. 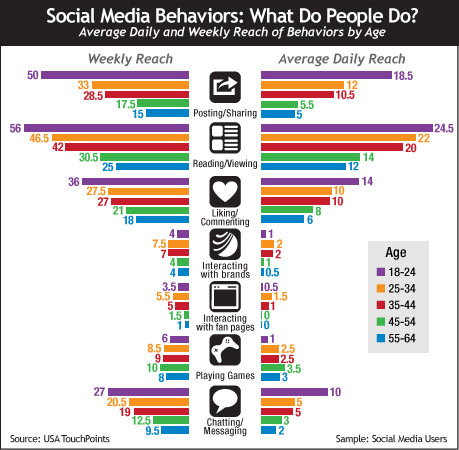 This USA TouchPoints analysis looks at how different age cohorts use social media of all kinds on a daily and weekly basis, drawing on a sample that interacts with social media at least once in the average week. The only activity that delivers greater reach of every cohort from 18-24 to 55-64 is the most simple and basic function of social media — reading or viewing the content posted by others — whether in a Facebook Newsfeed, the Twitter stream, a Pinterest home feed or anything else. This is not entirely surprising. Even if going to a network with the express intent of sharing content, a user is probably going to read other content while doing so. From here, the cohorts are split. Younger age groups are more likely to Post or Share content than to Like or Comment, whereas the reverse is true for older cohorts — on the basis of both daily and weekly reach. Directionally, the trend that emerges from this analysis is not only that younger cohorts — as expected — use the different social media functions more than older groups, but the difference appears to be greatest with activities that could be thought of as more pro-active: Posting/Sharing, Chatting/Messaging, as opposed to those that are perhaps more passive, such as Reading/Viewing. The most obvious exception to this is Playing Games on social networks, where average daily and weekly reach effectively shows a reversal of that trend. That's a reflection of the success of casual gaming operations like Zynga and others to provide games that act as relatively undemanding, socially structured boredom busters to users at work, home and on the move. Inevitably, such an analysis prompts further questions relating to devices used, times of day that different groups exhibit different behaviors and so on. These and other questions will be addressed in future analyses.